CRC Handbook of Materials Science is a readily accessible guide to the physical properties of solid state and structural materials. Interdisciplinary in approach and content, it covers a broad variety of types of materials, including materials of present commercial importance plus new biomedical, composite, and laser materials. 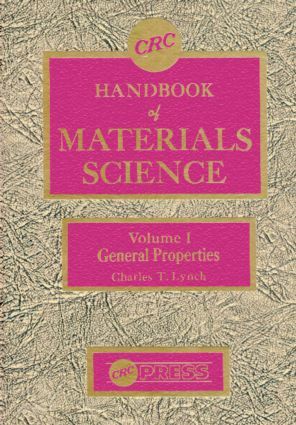 Volumes I, II, and III edited by CHARLES T. LYNCH, Ph.D., U.S. Air Force Materials Laboratory, Wright Patterson AFB. VOLUME I: GENERAL PROPERTIES: The Elements. Elemental Properties. Miscellaneous Tables of Physical Properties. Conversion Tables, Miscellaneous Materials Properties and Binary Phase Information. Materials Standards. 760 pp., 7x10, 1974, ISBN-0-87819-0231-X.